As the Koran-flushing-in-Cuba episode becomes old news, the Muslim Public Affairs Council (MPAC) has helpfully found a way to keep Koran desecration in the public eye. It does so – and I draw on MPAC's two press releases (here and here), plus reports from the Associated Press and Los Angeles Times – by promoting the story of one Azza Basarudin, who bought a copy of the Koran, Oxford University Press edition. I dropped the book because I didn't know what to do. I was paralyzed after 9/11 — I couldn't leave my house for a couple of weeks — and I realized that fear was coming back. I couldn't even go near this book for a couple of days. I feel like I'm being violated all over again because I'm a Muslim. Basarudin asked MPAC, Los Angeles' contribution to the radical Islamic lobby, for assistance. It agreed and duly contacted Jeff Bezos, CEO of Amazon, to whom it laid down the usual Islamist strictures: an investigation, a public condemnation, "a policy of zero tolerance toward this type of behavior," and (of course) financial support for MPAC. Amazon at first only apologized for "distress caused by incident," so MPAC turned up the heat by holding a press conference on May 18 (at the Islamic Center of Southern California, no less). The publicity worked. Patty Smith, director of corporate communications for Amazon, responded by calling the matter "appalling" and distanced her company from it. She noted that the Koran was purchased from Bellwether Books, not Amazon itself. She explained, "This was not our inventory, it was nowhere in our order or fulfillment process. It was a used book purchased through a third party." Still, she apologized, offered Basarudin reimbursement, a gift certificate, and promised to fire any employee who defaces Korans. She also ­– the kicker – indefinitely suspended Bellwether from selling Korans through Amazon and said that if the problem recurred, Bellwether would be banished from Amazon. That meant Richard Roberts, owner of Bellwether, had to respond, and he did, denying that his employees defaced the book and pointing out that used books frequently have markings. He explained how the staff gives a cursory check to the four hundred books it sends out each day without closely inspecting them. He apologized to Basarudin, said any employees found desecrating the Koran would be fired, and offered to replace the book. He also promised to assign, in the Los Angeles Times's wording, "a quality-control officer to rigorously check incoming and outgoing books." Support and fund educational programs that foster religious tolerance. 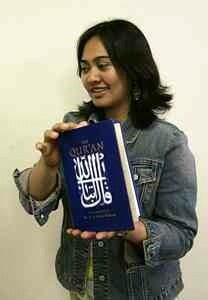 Azza Basarudin and her Koran. Comments: This incident, far quieter than the Newsweek flap, is in its own way no less instructive or important. (1) MPAC did not mention that the customer in question, Azza Basarudin, 30, is an Islamist affiliated at one time with the Islamic Institute of Human Rights, headed by Wissam Nasr. (Nasr now heads the Council on American-Islamic Relations (CAIR) office in New York.) For an example of her thinking, note above, how she presents 9/11 not as an occasion when Muslims violated Americans but when Americans violated Muslims. In other words, this is no average customer. (2) MPAC also neglected to mention that Basarudin bought a used Koran, not a new one. Used books buyers do not normally expect vendors to clean their purchases of markings by former owners. (3) Is it pure coincidence that this Koran episode is so perfectly timed to follow the Newsweek and Guantánamo controversy? One can't but wonder if Basarudin, like at least seven other U.S. Muslims, is faking her own persecution. Or if, like its colleague CAIR, MPAC stokes anti-Muslim hate even where it does not exist. (4) If Muslims succeed in requiring that Korans undergo inspection for impurities before being sold, booksellers might well cease handling Korans. (5) The idea that a Muslim has the right, without proof, to accuse a non-Muslim of blasphemy, as Basarudin and MPAC have done, brings to mind the notorious anti-blasphemy laws in force in Pakistan. There, as the World Council of Churches explained in 2000, those laws "have become a major tool in the hands of extremists to settle personal scores against members of the religious minorities particularly Christians." In the United States, the blasphemy accusation serves as the basis for a Jesse Jackson-like corporate shakedown (note MPAC's demand for Amazon to fund its programming). (6) That Amazon suspended Bellwether from selling Korans via Amazon is a symbolic punishment rather than a substantive one, but it matters nonetheless. Can one imagine any other book's defacement leading to such a penalty? (7) This episode is yet another instance of Islamist organizations relentlessly seeking special privileges for Islam. At a time when American Catholics must endure "art" that consists of the crucifix in urine and a Virgin Mary made in part of elephant dung, why should American Muslims be indulged in their exquisite sensibilities? As Stephen Schwartz keeps repeating, if Islam is to flourish in America, it must adapt to America. (8) Amazon should answer MPAC firmly in the negative, reinstituting Bellwether's right to sell Korans at Amazon, making no public condemnations, and not giving money to MPAC. If you agree with this conclusion, let Patty Smith at Amazon (psmith@amazon.com) know your thoughts. I do purchase books from Amazon on a regular basis. I am appalled that a company such as yours should have allowed nefarious activism to deny one of your vendors the right to further sell Qurans via Amazon, based on the Basaruddin complaint. What does one expect when s/he purchases a used book anyway? Are the Amazon vendors supposed to erase comments, when those comments are illustrative of a reader's feelings? To what extent does such censorship go? I like to find the comments. I am Muslim too, and rather than seek to discipline an innocent bookseller, would have questioned myself and my religion to see what about it causes such hate from outsiders. And I would have sought to act in a manner that corrects the problem. And that would not have included the punishment of innocents. And this one, also dated May 20, from Michael Selzer, the founder of Bibliofind.com, a used-book service. This is Michael Selzer whom you may know as the founder, along with his wife Helen, of Bibliofind. I am writing to you about Amazon's handling of the Bellwether-Koran imbroglio. I would agree that a bookseller who intentionally and repeatedly sends out books that contain inappropriate inscriptions should be removed from Amazon. We would have done that while we were running Bibliofind, though no occasion for doing so ever arose. However, I don't believe that Bellwether makes a practice of selling such books. Unfortunately, booksellers do not always inspect each and every old or used book they sell as conscientiously as they ought to,and the defaced Koran presumably shows that Bellwether, too, although a respectable bookseller, can sometimes slip up. On the other hand, I notice that Amazon not only sells a number of books by Adolf Hitler, but even allows readers of them to post their opinions on Amazon's site. Among the opinions of Hitler's "My Struggle" which I found on the Amazon site is one posted by a certain J.Martin of, as he calls it, "Brownited States of Jewmerica", under the caption, "The man that lucidly saw the truth". This is a lengthy diatribe, but the following extract will show you the flavor of Mr Martin's little essay: "About non-Whites in Europe.....well.....there would never be a Nazi Party if non-Whites were out of Europe. Hitler was a fabrication of nature, what an ethnicity or race naturally does, tries to protect its society from people outside their Civilization. If jews were w/ the arabs....they are all semites, Hitler wouldn't have risen to power. " I'll grant you that there's a difference between inadvertently selling a Koran that contains an anti-Muslim inscription on the one hand, and - on the other hand - knowingly selling anti-Semitic books and allowing anti-Semitic remarks to be posted on your own website. But I'm not sure that Amazon benefits by the comparison. May 23, 2005 update: Three days later, Amazon has developed a standard reply to letters coming in on this subject. One reader who received it dubs It "pre-prepared grovel." The letter reiterates the policy I criticized ("At our request, the seller is instituting more stringent quality control over its incoming stock. Also, Amazon.com has suspended the seller from listing any copies of the Qur'an on our site for the indefinite future, though they are free to sell all other books"). One wishes that Amazon had learned something from the many eloquent letters it received (and even that its p.r. people wrote more grammatically). Thank you very much for writing to us about this sensitive issue. Amazon.com does not tolerate discrimination of any kind, and we share the distress and deep concern that the Muslim Public Affairs Council has expressed about the report concerning the used book purchased from one of our third-party merchants. As soon as we learned about the defaced product, Amazon.com immediately apologized to the customer and contacted the seller to investigate the incident and ensure they take steps to prevent this from happening again. The altered book was purchased in used condition from a third-party bookseller through Amazon's Marketplace. As you may know, Amazon.com provides a platform where third-party sellers can offer new and used books for sale alongside new books offered by Amazon. Products purchased from a third-party seller are fulfilled directly by the seller, not Amazon.com. In this case, the seller has listed its products on Amazon.com for over a year, and has received a 4.9 "star rating" (on a scale of 1 to 5) from thousands of Amazon customers. In this case, the seller was not able to determine when the product was altered, and it appears likely the book was defaced before it ever reached the seller's inventory. At our request, the seller is instituting more stringent quality control over its incoming stock. Also, Amazon.com has suspended the seller from listing any copies of the Qur'an on our site for the indefinite future, though they are free to sell all other books. As a bookseller, we believe that offering customers open access to written speech is one of the most important things we do. We place the utmost value on providing customers the ability to partake of any and all viewpoints and ideas freely, without scrutiny or judgment by others. We know firsthand that the ability to share ideas can foster greater understanding among and between people of all faiths and religions. Thank you for your comments. It is always important for us to hear how customers react to all aspects of shopping at Amazon.com.